Two representatives of the Libyan patriotic movement in support of the candidacy of Dr. Saif al-Islam Gaddafi in the upcoming elections for the presidency of Libya in 2019 held meetings in Moscow with political and public figures and journalists. They handed over to the leadership of Russia a letter from Saif al-Islam Gadhafi, which sets forth a vision of overcoming the crisis by Libyan patriotic forces. Dr. Mohammed Al-Goddi, political advisor to Ph.D. Saif Al-Islam Al-Qadhafi, answers the questions. How do you assess the current situation in Libya? Since 2011 (March 19, 2011, the NATO alliance began bombing Libyan cities and towns. —N.S.) The situation in Libya continues to deteriorate. Elections were partially held in 2014, but not all Libyan citizens were admitted to these elections; Yes, and those who have chosen are in great disagreement among themselves. As a result of the elections, the government of the so-called national accord came to power, but, unfortunately, there is no agreement, the discord has deepened even more, and external forces constantly intervene in Libya’s affairs. All the terms of operation of the government and the parliament, which they agreed upon, are already overdue, and so far they have not been able to agree on the extension of the agreements. As a result, there are two governments in Libya, one in Tripoli, the other in El-Baida, and another organ has been created - the Supreme Legislative Council; it is also called upon to play the role of parliament. All the country's institutions were divided: financial, political and all the rest. For example, in Libya there are two central banks and two oil companies, the army is also divided between the west, east and south of the country. This is the situation in Libya today. Under Muammar Gaddafi, there was justice; laws were in place to protect society, especially children. Until 2011, before the direct intervention of international forces, the Libyan people had a good standard of living. The people themselves solved their internal problems. Those forces that intervened in our lives were against the people's system. The Jamahiriya died, and we no longer have a state. Of course, the reason for this is the intervention of foreign forces, which used the internal problems of Libya for their selfish purposes. Today, ordinary people in Libya are not only in need of basic nutrition, but they cannot even ensure their personal safety. Even in their homes, they do not feel at home, because banditry has spread throughout Libya. The law on political parties, adopted in 2012, is in fact not in effect, so we cannot say that the discord between Libyans is a political discord. This is a rift between different trends that exist in Libyan society. Most Libyans speak in favor of the regime that was in Libya before, and Saif al-Islam Gaddafi is a symbol of this former government. Most Libyans support him. And I especially want to note that he is supported by the majority of young people of Libya. And, of course, those who have always been a supporter of the Jamahiriya stand up for him. What can you say about the army of Libya? Efforts are being made, in particular by Egypt, to unite the army, military units, but, unfortunately, these efforts have not yet yielded results. When we talk about the army, we mean the army, which was until the end of 2011. This power is still divided. In the east of the country there are military units under the command of Haftar, in the west there are various forces that are somehow connected with the so-called government of national accord. Many soldiers and officers (the army of the Jamahiriya, which fought in 2011 against terrorists and NATO special forces) joined the military units of Haftar, some of them created their own various armed groups. Therefore, it cannot be said that there is a single army in Libya, the military forces in Libya are fragmented. What can you say about the struggle of the Libyan people against international terrorism? Unfortunately, the absence of state power in Libya makes it possible for terrorist groups - gangsters and mercenaries from different countries - to commit atrocities on Libyan soil. These groups seized several cities in Libya, such as Sirte, Born, and even partially Benghazi and other cities. We see the direct intervention of external forces in the affairs of Libya, there are differences between these forces, and this further worsens the situation in Libya. There are terrorists in different places, taking advantage of the fact that there is no single government in Libya. And there are forces that fuel disagreements: both the personalities chosen by the Libyans and those appointed from outside. The reason for the differences between the Libyans is the intervention of foreign forces in the affairs of Libya. For the seven and a half years that have passed since the events of 2011, international organizations could not find a solution to the Libyan crisis. The participation of all Libyan parties is the most important thing in the Libyan “road map” of the “unification of the nation”. We have always advocated that the Libyans themselves negotiate with the Libyans themselves and develop a road map of a way out of the crisis. Our position corresponds to the position of the UN representative on Libya Hasan Salame, who proposed to convene the Libyan National Congress in 2019, we fully support him, and our point of view coincides with his point of view. At this congress, Libyans will discuss ways to national reconciliation and measures that will contribute to this. Differences concern both political and social issues. All this, of course, takes time. The topic of reconciliation will be proposed as the main one at the National Congress. With the beginning of the reconciliation process in the country, another “climate” will be created, it will be necessary to prepare for the adoption of the Constitution. How is the development of Libya's Constitution? A commission was created to prepare the text of the Constitution, there were great differences, so it was not possible to create an atmosphere that would contribute to the drafting of this important document. In the end, we prepared a draft and proposed it to parliament. And the parliament decided to vote for, but there are serious objections from some forces. We think that if there is a people's referendum, then there will be an answer to these forces. The point of view of Saif al-Islam Gaddafi is the point of view of the Libyan youth. He is a reformer. He found answers to many questions and performed his work well. Yes, the draft Constitution was already ready. He achieved agreement between various political forces and freed all political prisoners. He also developed at that time a large project for the development of Libya and was engaged in resolving problems that existed in relations with other countries. He has prepared projects for updating youth national policies and the use of human resources. Libya was the foremost African country in this area. This is a great merit of Saif al-Islam, and Libya will not forget this. Can we say that the Congress, which will be held in January next year, will really be the beginning of the internal Libyan dialogue? 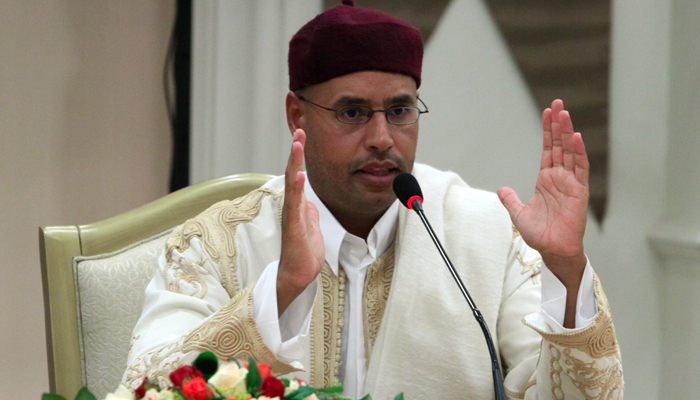 Saif al-Islam Gaddafi called for a dialogue between Libyans back in 2011. To the dialogue without any preconditions, to the dialogue without foreign intervention. And today the Libyans see that this dialogue, during which solutions will be found, is extremely necessary. Is it possible that during the work of the January Congress a provisional government will be created for the transitional period of preparation for the elections? Libyans are already tired of "transitional periods." All this has been going on since 2011, Of course, it is very important who exactly will rule the country until election day. After all, the preparation of presidential and parliamentary elections will take several months. Therefore, if at the Congress we, the Libyans, agree among themselves what the government of national accord should be for this period, it will be so. After all, the main task of this government should be only the preparation for the elections. You met with the special representative of the Russian president on the Middle East and African countries, Mikhail Bogdanov. How do you assess the current Russian policy towards Libya? We were given the opportunity to explain during the meeting our point of view and our vision of how to solve the problem of Libya. We realized that he has a complete understanding of the problem itself and its causes. We set out a "roadmap" for the elections, our positions regarding the conduct of the Congress and the resolution of the Libyan problem as a whole. That is, we set forth the point of view of Saif al-Islam Gaddafi on all these issues. In addition, we discussed with Mikhail Bogdanov the problems that arose as a result of external interference in the affairs of Libya and outlined our position. As it turned out, our points of view are the same! Not so long ago, the words of a “revitalization” of Russian-Libyan cooperation were heard in the government apparatus of Russia. We have had good relations with the Soviet Union and Russia at all times. Until 2012, there were many Russian companies operating in Libya. Large projects worth billions of dollars were being implemented. There was an important project for the construction of the railway. He and other mutually beneficial projects were frozen. Of course, Russia is committed to ensuring that the Libyans themselves have restored the country's statehood in Libya. This will allow our countries to establish cooperation in all areas. Russia has lost a lot in Libya, in 2011, Russian companies left Libya, many economic contracts and agreements between our countries have faded into oblivion. If a peace period soon begins in the life of our country, Russian companies can return and work as widely and successfully as they did before. The Russian people were admired by the River of Life, the great project of Muammar Gaddafi, which was implemented by Libyans through international cooperation and which they called in 2010 the Eighth Wonder of the World. In what condition is the Great Man-made River now? All the infrastructure of Libya has suffered from the NATO bombings: both industrial and civil. And the objects of the Great Man-made River, too. Since then, the situation has not improved since 2011, and even worsened due to improper management (and even the lack thereof). But I am sure that when peace comes to Libya, everything will be restored and the River of Life will “work”, as before, for the benefit of the Libyan people. Libyan civilization has ancient roots. Russian scientists traveled all over the Sahara, revealing petroglyphs and rock paintings created by artists of the past. At the time of the Jamahiriya, on the Libyan Mediterranean coast, the Libyans continued the excavations of ancient Garamantis, Carthage, and found unique works of art that were declared by UNESCO "treasures of humanity" and "riches of world culture". In what state are they in now? The ancient cities of Leptis Magna, Sabratha? .. In these past seven years, everything in Libya has been destroyed. If people have suffered so much, what can we say about the works of Antiquity? Much was destroyed, partly - plundered. Values are poorly protected. There were various international reports that it was necessary to save them, but all in vain. The state institutions themselves, which cared for both people and ancient values, were destroyed. What is the fate of the statues of the Museum of History of the Jamahiriya on Green Square in Tripoli. Where is the antique statue of the Tripolitan Venus from this museum now? I can not say anything about its fate, about the fate of other statues. But I know that those ancient monuments that were not damaged by the NATO bombings were destroyed by the Islamists. They even destroyed the shrines of the Islamic world in Libya. You met with Russian political and public figures. Your impressions? We came to Russia with the hope that it would support us in an effort to work together with the United Nations and implement a road map that will lead to open, democratic elections in Libya. Russia has always responded and came to the aid of the countries of the Arab world. And today, for us, supporters of a peaceful exit of Libya from the crisis through democratic elections, it is important to enlist political support from Russia.